After many years of being an individual top producing agent, it was clear to Nancy Johnson it was time to expand. The challenge for her was finding competent people that had her same drive, enthusiasm, loyalty customer service, and drive for satisfaction that Nancy needed to make sure her clients were happy and well taken care of. 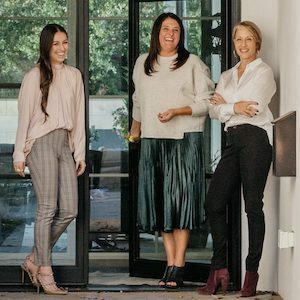 After graduating from the University of Arkansas with a major in Marketing and minor in Real Estate, Nancy’s daughter Alex, joined the team as an assistant. She has since evolved to become one the brightest and most adept young realtors in the metroplex. In addition to assisting Nancy with styling homes, she has her own client base that is expanding each year. In January of 2017, Nancy also added realtor Amy Malooley, who has been in the industry since 2006. Amy brings to the group extensive knowledge of the market, devotion to customer service, and an exuberant personality. Amy is delighted to work alongside Nancy, an industry juggernaut she has admired for quite some time. Nancy also discovered that in order to effectively manage her high volume, while still providing “hands on” customer service, she needed help, so she brought two assistants on board. Megan Marrin joined the group in February of 2015, and came from a background in teaching. She is organized, attentive to detail, and diligent about responding to clients’ needs. Nancy’s other assistant, Jo Schellenberg joined the group in February 2017, but has been with Dave Perry-Miller as Listing Coordinator since 2012. Jo brings to the team a superb eye for detail, dedicated work ethic and great sense of teamwork. Last, but definitely not least, Judie Heitzman works with Nancy as a home stager and stylist. With Judie’s degree in Interior Design, she and Nancy collaborate on styling and staging in order to display the home in its best light, helping to minimize days on market and maximize sales price. Together, these six strong and fun-loving women make up The Nancy Johnson Group. Not only is this group consistently #1 in East Dallas, we are also consistently among in the top 5 in Dallas. We have successfully mastered maintaining a personal level of service, while we continue to grow. While much of the group’s business is from prior clients, we also steadily add new business, because of our vast knowledge of the market, contract expertise, negotiating, staging, styling, and most importantly, the clients that become our new friends.